Smart shopping involves understanding how to avoid overspending, preventing unnecessary purchases and staying strong in the face of tasty temptation. You’re going to need a great deal of self-control when you hit the shops to learn how to pass up the huge red sale signs that are designed to grab your attention and convince you to buy things that you don’t really need. If you take a little extra time and put more thought into your shopping experience you can end up cutting your shopping bills in half. Here are just a few of the best tips to help you to shop smarter. Shopping on the web has become one of the most popular and convenient ways in which we choose to shop. A great way to save money whilst shopping online (besides using price comparison sites) is to use the included search box tool to find exactly what you are looking for. This not only saves time it will present you with the required item that you wish to buy. This will save money as you will no longer need to search through a massive catalogue of items and be tempted to buy this and that instead of just purchasing the item that you originally came for. One of the most common ways that people save money on their groceries is by creating a weekly shopping list and budget that they bring with them to the store to help keep them on track. Visit the lifestyle section here to find an example shopping list and meal planner. Even the NHS advises this method to shop smarter. According to the NHS it is a good idea to think about which meals you will have over the week and to make your list based on the ingredients needed for each meal. This is thought to be a better way in which to stick to your shopping list and to avoid making any unneeded purchases. Leave your credit and debit cards at home when you go to the supermarket as they can make it all too tempting to buy more than you actually need. Using a set amount of cash will help to keep you on track. If you use a debit or credit card at the supermarket, it tends to take away the reality of the situation, as you cannot visibly see the money you are spending and therefore it seems less real in a sense. 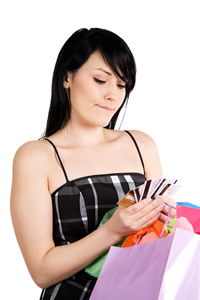 This can result in overspending so set yourself a budget and make sure you stick to it by paying with cash only. It can be easy to let others influence what you do and do not buy at the supermarket. According to Real Simple this phenomenon is known as ‘group-level consideration’, which means that the group ‘establishes the spending norms and defines what is acceptable and condonable.’ Thus, shopping with a larger group will often result in a larger shopping bill. If you shop by yourself however you will be in charge and the only person making the decisions will be you. It’s easier to stay in control if nobody else is influencing buying choices. Christmas Is Only 100 Days Away – Is Your Personal Finance In Festive Shape?